CHICAGO (VIP-NEWS) — US rockers Fall Out Boy have ended a three-year break and announced that they are to release a new single and album. The Illinois foursome said they were taking a break after the release of their greatest hits in 2009. A new record, Save Rock And Rock, will be released in May. The band have also confirmed a short world tour in February, followed by more dates in North America in May. A new single, My Songs Know What You Did In The Dark (Light Em Up), has also been made available online. In a message to fans on their official website, the group said: "This isn't a reunion because we never broke up". "We needed to plug back in and make some music that matters to us." The band will play London's Underworld venue on 25 February. During the break from the band all of the members pursued different musical projects. 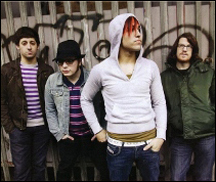 Lead singer Patrick Stump released a solo album and bass player Pete Wentz launched a project called Black Cards. Writing on his blog in February 2010 Pete Wentz said the band "grew apart", adding, "If this is our legacy than so be it."